PHL Cycling national junior member Luis Miguel Maximo of Cebu-YKKBikes.com finished with a bronze medal in the Men’s 16-19 category of the Philippine Duathlon Series last Sunday in Alabang. Maximo, who was facing an unfamiliar race course and lacking in logistical support, negotiated the 6K run, 30K bike, 3K run in 1:40 in the event that attracted more than 300 athletes, making it one of the biggest duathlon races in the country. The competition is presented by Powerade and organized by Adrenaline Multisport Group headed by Thumbie Remigio. “I was lagging behind in the run legs but I made up for it during the bike portion. The Campagnolo 11-speed groupset and shifters installed in my YKK time trial bike made a big difference during the bike race because I have more gears to choose from and the shifting was fast and easy, which resulted in a faster time,” said Maximo. Maximo, mentored by UCI/ITU certified duathlon coach Patrick Joson, kept his run deficit at a minimum and capitalized during the bike portion to make up for lost time. “I never thought I can climb the podium on my first duathlon race. The competition was tough with the presence of elite and seasoned athletes. 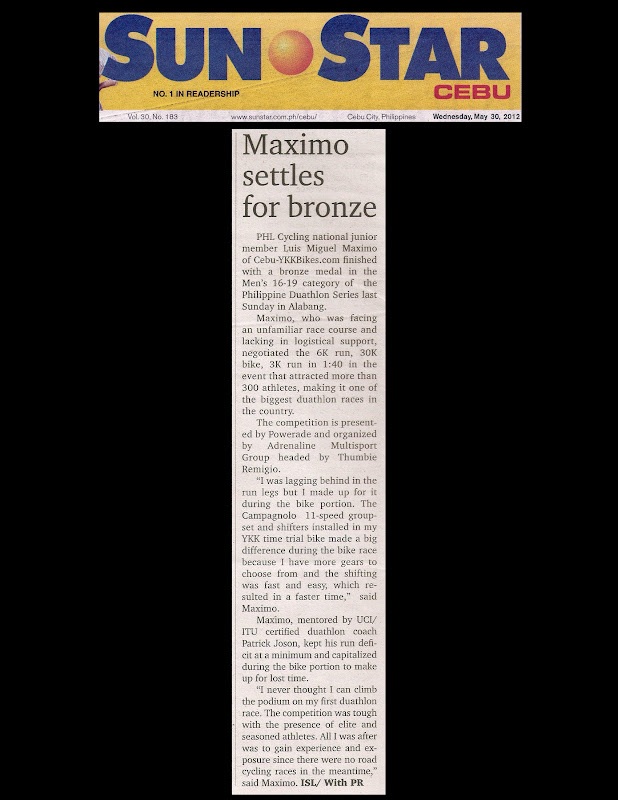 All I was after was to gain experience and exposure since there were no road cycling races in the meantime,” said Maximo. 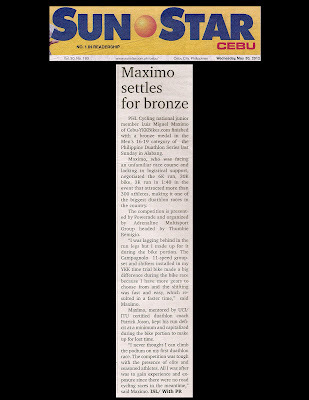 Published in the Sun.Star Cebu newspaper on May 30, 2012. PHINNEY: "IT SEEMS LIKE IM CRASHING EVERYDAY"